Where are Priority Club PointBreaks? Do we care? Where are the Priority Club PointBreaks?! And should we care? The wailing and grinding of teeth amongst lovers of Priority Club’s PointBreaks promotion is reaching fever pitch! Has their favourite promotion disappeared for ever? For those who don’t know what I’m talking about, here is a catch-up. Priority Club is the loyalty programme for Holiday Inn, Holiday Inn Express, Crowne Plaza, InterContinental, Staybridge Suites, Hotel Indigo and Candlewood Suites. It has a reputation for being a very poor programme if you want status recognition, but a very good programme if you want to earn points quickly, due to its generous promotions. Reward nights typically run from 40,000-50,000 points for an InterContinental and 25,000 points for a big-city Holiday Inn. Every two months, Priority Club publishes a list of ‘PointBreaks’. This is a list of usually 50-75 properties which, for the next couple of months, can be booked for just 5,000 points per night. This can be a discount of up to 90% on the usual points requirement, and is laughably generous given that you can generate 10,000+ points from a single stay with the right promotional codes. Because Priority Club covers a huge global chain, PointBreaks hotels can be anywhere. There are people who plan their holidays around them – if you want to fly to Europe from the US and don’t mind where you go, there are usually enough PointBreaks properties to give you a fun couple of weeks. The same is often true of Asia. A new PointBreaks list comes out every couple of months. The exact date moves around a bit, but it should have been mid July, give or take. And here we are at the end of July with no new list. There are still some hotels listed, but these are the last few from the May list which did not sell out of their PointBreaks allocation. Now, here is the thing. All hotels have a limited number of rooms for PointBreaks. When they’re gone, they’re gone. The most popular properties (ie the best bargains in the most popular cities) go within 24 hours of being listed. And unless you are a very frequent visitor to specific Flyertalk threads where people who check priorityclub.com every couple of hours post what they find, you are unlikely to get in on the best ones. Within a few hours of release, the list of new properties will also have been published on all of the major travel blogs. (I imagine that I will cover them as well, assuming that a new list does come out.) Even more properties will quickly disappear off the list. Basically, PointBreaks have become a nice treat from Priority Club for readers of Flyertalk and travel blogs. The chance of a casual Priority Club member getting one in a top location is very slim. I would even go so far as to say that the average Priority Club member thinks that PointBreaks are a load of rubbish. After all, whenever they look at the list all they see are the scraps. It would help if Priority Club emailed all its members to announce when a new list was being released, but they don’t. 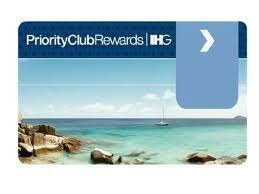 As it stands, PointBreaks may even be worsening most members attitude towards Priority Club, rather than improving it. Anecdotal evidence convinces me that there is a large % of breakage on PointBreaks redemptions. Because the best hotels go so quickly, people book without being sure they can make the date. Some Flyertalker’s openly say they have booked a number of different dates and will cancel the spares when they have firmed up flights. The problem is that, as far as anyone has ever been able to tell, cancelled PointBreaks redemptions do NOT go back into the pot. And the better the hotel, the more likely people are to make speculative redemptions that they will not keep. This means even fewer 5,000 point rooms for everyone else at those properties. When PointBreaks first started, Priority Club said that they would be non-refundable. That would have made some impact in stopping people booking nights they never seriously thought they would use. As it turned out, PointBreaks are fully refundable, so you don’t even have to risk your 5,000 points by booking as soon as the list appears. At the end of the day, PointBreaks have become too popular for their own good, dominated by a small minority of Priority Club collectors. (Technically, that includes me – I have never booked a PointBreaks hotel, but if a really good London property turned up I would have no qualms about booking it for a month and using it as my office.) It may be time to say goodbye to them. Sorry Raffles, I don’t understand your logic. Many promotions and deals and obscure and are never known about by the general public. Even flight redemptions to popular destinations you need to be checking daily at T-11 months to secure. Doesnt mean they have had their day. However I do think the system could be tweaked. Examples, one pointbreak booking per account. Max number of days booking. Non refundable points in case of cancel. Priority of booking based on nights per last 12 months. (e.g. day 1 for clients with >100 nights, day 2 clients with > 80 nights, etc). Anyway must go now as I need to check if the list has refreshed every 30 mins!!! My argument is that the bulk of the ‘good’ PB nights are, every time, hoovered up by the same small clique which represents only the tiniest fraction of the 65 MILLION members of Priority Club. (Yes, 65m – basically the population of the UK!) This is not necessarily, looking at the bigger picture, a good thing. Especially the UK. Unless you love Runcorn or Bolton! I will post the list tomorrow.